Pork belly with crackle, crème fraiche mash, apple, radicchio, radish and golden raisin. 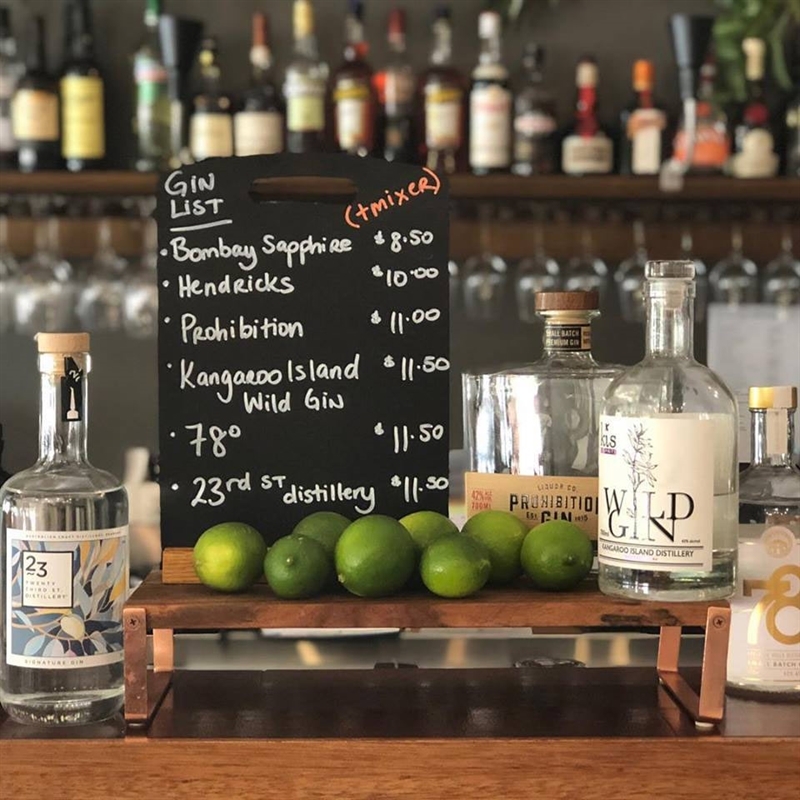 Aptly named for its location beside the old post office, award-winning Stamps restaurant is quaintly tucked away on a leafy back street of Mitcham in Adelaide. 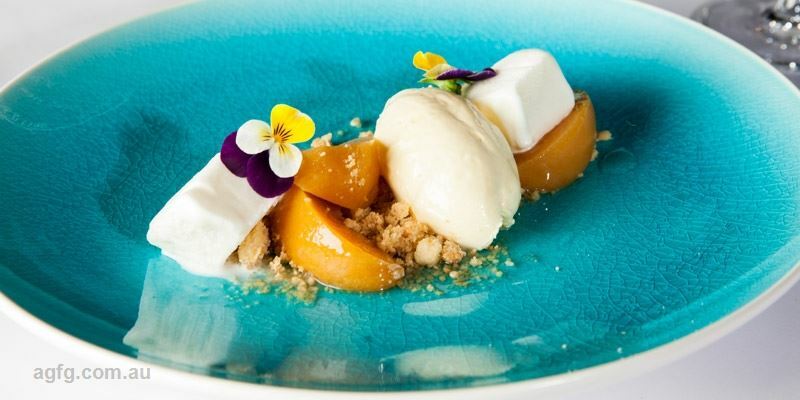 While the gorgeous heritage building with its vine entangled verandah exudes old-fashioned charm, Stamps’ seasonal menu is undeniably contemporary; with dishes that change frequently to emphasise fresh produce and the Chef’s passion, spontaneity and talent, the locals are always coming back for more. 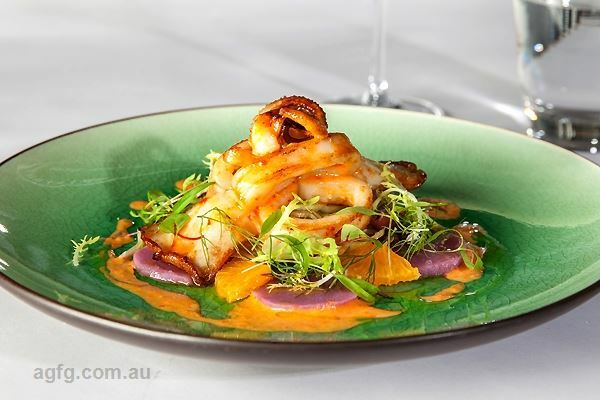 Select from options like Spencer Gulf prawns, minced pork, rice noodles, green papaya, pickled carrot and crispy shallots; before delving into mains of slow roasted lamb, couscous, grilled eggplant, muhammara, feta, mint and peas. 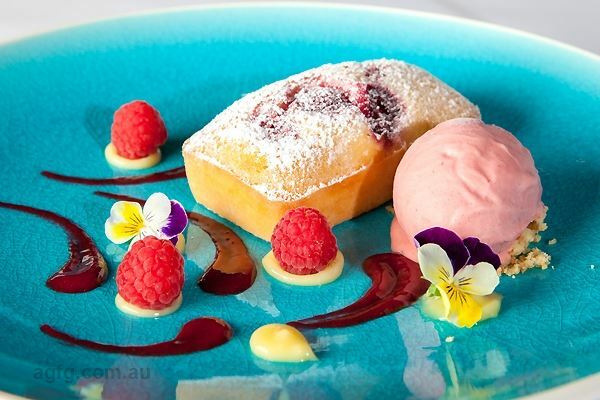 Be sure to leave room for tempting desserts like berry and almond tart, lemon curd and elderflower cream. Seats: 50 Chef: Brenton Allan and Ben Packer. Our family has visited many times over the last 20 years and it has always been brilliant. 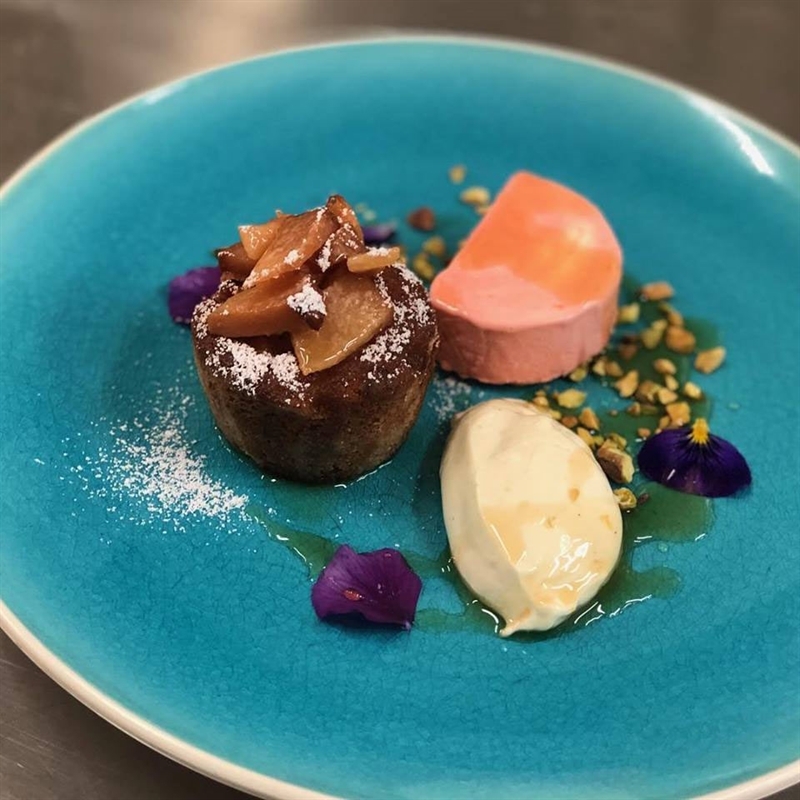 All meals, from enter to main, are beautifully plated and delectable, the wine list is outstanding, BYO happily accommodated and functions expertly catered. Children ‘s menu is a scaled down version of the adult menu, respecting the fact that children deserve, and enjoy, well cooked and presented food. The restaurant is located in an old bluestone post office, garnished with grapevines. A brief photographic history of Mitcham is on the walls, and blends with the environment, ensuring that it doesn’t impede the restaurant’s warm, convivial yet refined air. My husband and I had a stunning meal at Stamps again last night. We have been going there for over 10 years and the food, service and ambience has been consistently excellent. From a light gig and taleggio tart to a gooey centred chocolate soufflé with house made chic mint iceccream, my meal was superb. My husband’s dishes were equally impressive. The complimentary warm crusty bread and starter are always a touch that shows how the management care for its customers. Whilst the restaurant was full (quite unexpected on a Wednesday night in Adelaide! ), the privacy of all patrons was assured as the tables are set up to promote the feeling that the customer is cocooned in their own restaurant. Stamps also offers a range of dining offers, for different days of the week, which allows customers to have a quite reasonably priced, high quality meal. If I didn't live on the other side of town I'd be here every week. I think they are always good value but I am a sucker for the free corkage/fixed price menus on Monday. We went a couple of weeks ago; the venison was a knockout - 3 tender medallions, excellent jus and a serve of venison pate pillowed on a featherlight yorkshire pudding. My guests were equally pleased with their choices - and when one was dithering between two entrees the staff offered to provide one of his choices as a main. We returned this week. My entree of confit duck with puy lentils, and fennel and citrus was the size of a main at some restaurants, and it was delicious - crispy outside, tender within, and not too astringently salty. My beef fillet and cheek with baked polenta and a pea/mushroom ragout was very good if not quite as outstanding as the venison. Two courses there is a struggle and I could only look wistfully at the dessert menu; guests who compromised with a cup of coffee were given a tiny friand as a petit four. They do have a well-chosen wine list with a generous choice of wines by the glass, but is certainly an ideal place to take that special bottle. The corkage charge later in the week is reasonable by current standards. Stamps just keeps getting better and better- we've been coming to each menu for a few years now and never have we had a bad dish, problems with service or a negative experience. Not many places you can go to of this calibre over 4 times a year every year and say that about. The food- this is local produce, treated with respect. Sometimes the menu seems simple- don't let it fool you into thinking this isn't highly complex flavours that are balanced perfectly. They take everything to the next level- it's not just well cooked - it's presented amazingly. It has all the finishes you want and gets it right- consistently. Love stamps and will keep coming to every menu for as long as you'll let us! Who knew? Tucked away in the suburbs but easily surpassing other more lauded CBD restaurants, Stamps was a delightful surprise for a family birthday lunchtime celebration: Intelligent food combinations, generous servings, exquisite presentation, sensational flavours and nice pacing between courses; the service was friendly and courteous, but not irritatingly effusive. Between the six of us we sampled most of the entrees and main courses on the menu and every offering was consistently high class. The dishes were, without exception, extremely tasty with beautiful textures and colours and garnishes that really pulled their culinary weight! Every dish was so satisfyingly well conceived. One of the best restaurant meals I have enjoyed for many years. Well done, Stamps! I will DEFINITELY be back. Stamps exceeded our expectations for a suburban Adelaide restaurant, we having recently relocated from London. The food was exceptionally well presented and the combination of fresh, quality ingredients was absolutely splendid, making for a truly dazzling evening of new flavour combinations. The service was excellent, with every waitress being absolutely delightful, plus the Monday night deal of three courses for $65 plus free corkage made for great value for money as well. Stamps is deserving of its Chef Hats and arguably deserves more than it has already been awarded. We especially enjoyed the duck main course - using pomegranate and grapes was a surprising yet effective taste combination for us. 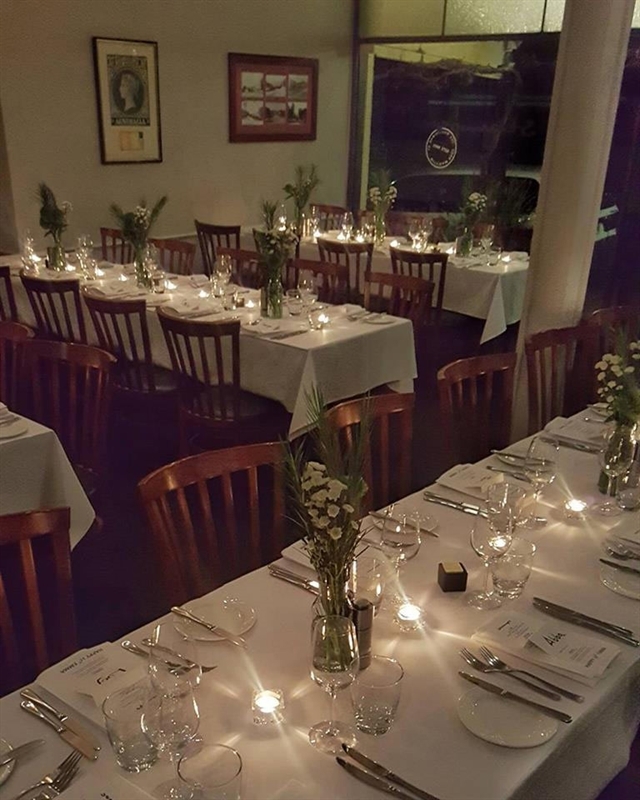 having been going to Stamps at least 4 times a year since 2010 I can confidently say that this restaurant is one of the most dependable when providing great food, fabulous service and a wonderful night all year round. We attended on Monday 10/11. The restaurant was full to capacity. Despite this, the staff (including the most wonderful Sebastian) made it look simple. Professional, diligent, friendly, attentive, comfortable- these men are the standard for great service. The food was immaculate, great flavours, fabulously balanced, artfully presented. Perfect portion sizing and perfect across all courses. We had specials and are so grateful we did. The venison special was amazing- who would have thought goats cheese, pumpkin and bread and butter pudding would go so well with venison? Their 'own garden' grown zucchini flowers were beautiful. I have finally found a white chocolate dessert that isn't too sweet. Chefs- thank you for a wonderful menu, great night- you excelled yourself- cannot rate this restaurant and it's staff highly enough. Great way to start the new year with the new menu at Stamps. One of their best yet (and that's saying something)- the beef with mole is amazing. The Pork main is beautifully done and well balanced. The beef carpaccio entree is fabulous- never had carpaccio before and wasn't sure what to expect but this was superb. Great service, fabulous staff, wonderful food- just brilliant. See you soon Stamps. Celebrating our 10th Wedding Anniversary and just loved everything from the time the door was opened until it was time to go. The food is out of this world. The service is first class and we were made to feel very welcome. Now we have to go back and try their breakfast. Stamps is always consistent- great food, fabulous service, first class quality produce. Individual preferences will always determine if you love the meal but if you don't like it- it won't be because its badly done, inferior quality or horrible flavors. I know NO OTHER restaurant that has managed to provide this level of consistency over years of food- never a miss- always perfect. Great dinner, great staff, amazing food. Flawless. Like home cooked food! Love this place! consistently beautiful food, beautiful presentation. Never had a bad dash over 3 years of going at least once for each menu and sometimes we go more than once (depends how many things we can't live without trying pop up on the menu). For a great nights food, great friendly service and consistency in all these things- can't go wrong at Stamps. Sunday lunch for 6 was a triumph earlier today. They know how to charge on the expensive side of reality bit the chef(s) do justice to the food. Try the melt in the mouth Stamps Pie. Walked away from the meal with a complete sense of satisfaction. Really impressed by the professional staff, the incredible food and the little surprises that made the evening special. 5 out of four stars. Of all the restaurants visited over the last 4 years, Brenton Allan and his staff at Stamps have provided the only one I can safely return to knowing I'll get exactly what I expect. Great service with fantastic seasonal courses that are inventive and inspirational but firmly grounded in taste and texture. Don't forget to ask when the next menu change is. 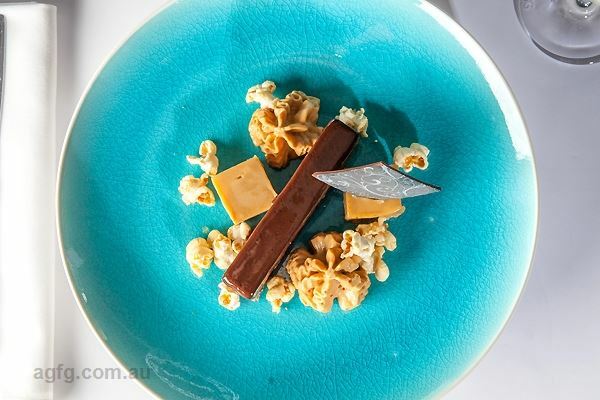 It's worth arranging your social calendar around it to see what new delights Brenton comes up with. Loved the scallops entree and the venison main on the current menu. Attended again this week- tried things that I wasn't sure if I would like and found them all to be wonderful. Beautifully carmalised scallops, perfectly cooked, the mustard oil was a pleasant jolt which made the dish leap to a new level. Lamb shoulder, very strong and rich but lovely flavours. Duck, 1st time I have ever really had duck and I can't say I love Duck but I did enjoy this meal and the fennel jam was the perfect side. My partner had the chicken with tarragon mousse which was beautiful. Beetroot salad and the ever wonderful crispy potatoes gave us a filling and enjoyable meal. Topped off with sorbets and icecream. Enjoyable meal- that's the great thing about stamps- even when you have things you aren't sure about- or new things- they are always beautiful. Strongly recommend for foodies- the price reflects the quality of food you will get. Beautiful food, fantastic service and it's consistently wonderful. 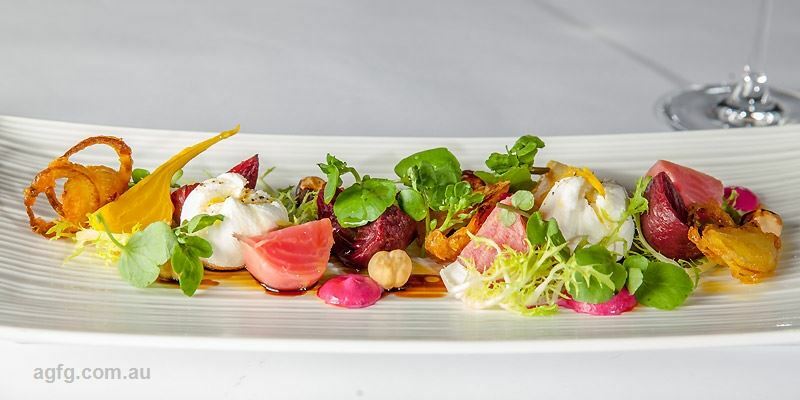 Each menu through the year has personal loves and likes but never a bad dish, always perfect portion sizes, clever and creative pairings of flavours and textures. Considering what you get- the pricing is reasonable. You definately get what you pay for- if you love great food, wonderful service and ability to talk even when the restaurant is full- this is the place to be. Seven of us had a Sunday breakfast for my partners birthday and were thoroughly impressed. The staff are attentative (without being overbearing), bright and genuinely friendly. After some well made coffee, ordered our meals and didn't have to wait very long before being served. Our meals arrived within a few minutes of each other which is always a appreciated. Lots of oohs and aahs as we enviously eyed off each others dishes of omlette, smoked salmon, pancakes, waffles (both sweet and savoury) and two of us having "The Lot". The conversation soon became quiet as we all tucked in. The dishes were perfectly cooked with the sour dough, waffles and pancackes all getting a special mention, but, the highlight were the scrambled eggs (the best in town) light, fluffy and buttery. Eggs are always the "make or break" element and these were superb. The portions were also right on the money leaving us very satisfied. We cant wait to try the dinner menu and will definately be regular customers if just for the breakfast alone. Thanks Stamps for a wonderful evening. Beautiful location, attentive service, and spectacular food. The menu changes seasonally too, so I'll make sure that I'm back regularly throughout the year to try the newest creations! I went to Stamps for my girlfriend's birthday last night and had an absolutely fantastic evening. The service was delightful, with the staff being friendly and observant without being overbearing and annoying. We ate the sticky beef for entree, then I had the Pork and my girlfriend had the Duck for mains. Both meals were incredible, as well as a great size. The crispy potato sides were delicious just to top it off! Can't recommend this quaint little restaurant any more! What an oasis in sleepy Mitcham! I never new this place existed until a friend told me . The heirloom beetroot and goats cheese looked like a painting and tasted divine! The pork done 2 ways with blood orange was complex but all the flavours burst in unison! The service was charming and we will defiantly be back! Thanks stamps! We have always loved dining at stamps. 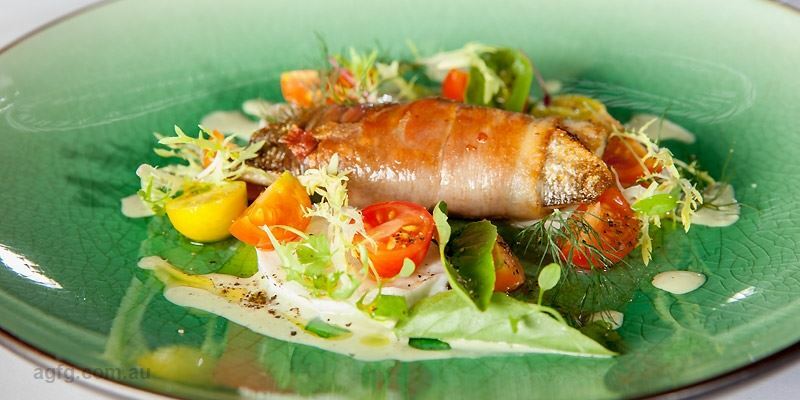 The food is very creative and of the highest quality. 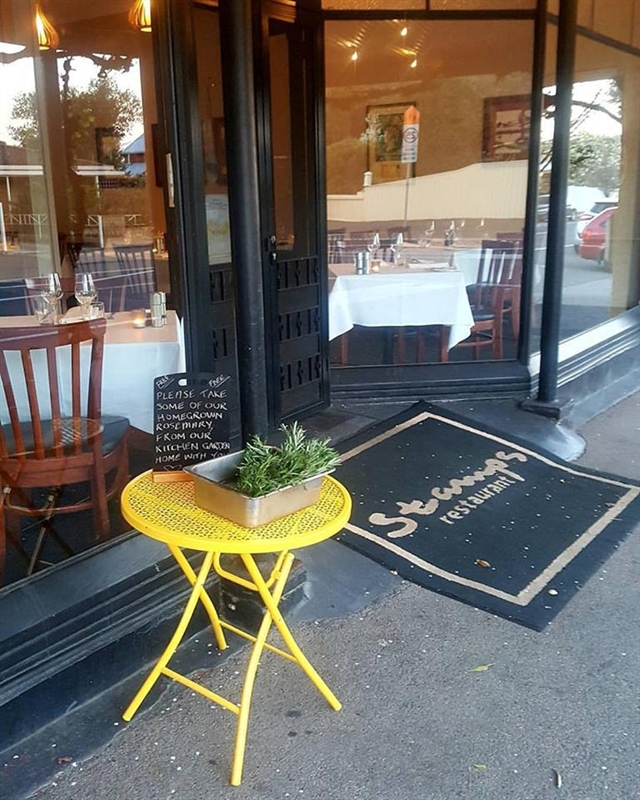 The waiting staff are outstanding, We went for the Monday night special $ 50.00 with free corkage and had the duck two ways, it was the best dinner In years.We will be telling everyone about this little restaurant!